When my husband I were first married, he had bi-weekly pay but I was paid weekly. That lasted about 4 months. Then he was paid whenever a load of wood was sold but I was still paid weekly. That was another 4-5 months. Then I was the only income for a couple months while he worked on getting his Class A commercial driver’s license. After my husband got another job, he was on a weekly pay schedule. He was at that job for 8.5 years. I got really used to budgeting based on a weekly paycheck. Even after I changed jobs twice and then quit working to stay home with my oldest child, he still had weekly pay. Every week. For 8.5 years. Then he changed jobs to a place that does bi-weekly pay. 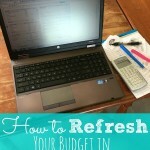 Those first two months were challenging as I learned about budgeting bi-weekly pay. You wouldn’t think it would be so tough but it was! Now that I have been doing it awhile, here are some things I have learned to make it easier. Instead of figuring out which bills need to be paid each week, figure out which bills need to be paid with the first paycheck of the month and how many need to be paid the second (yes, there are a few months with three paychecks…we’ll get to that). You might end up paying an end of the month bill in the first paycheck of the month to help split the paychecks evenly. The point is to try to have roughly equal amounts coming out of each paycheck for bills. There are two ways you can do this. You can divide in half and put half in savings until the next paycheck and you pay the bill. Or you can do the half payment method. With our mortgage and health insurance, I put half aside the first paycheck then pay with the second paycheck. With our truck payment, I do two half payments a month. It doesn’t have to be either or. You can mix and match as it works for you, as I have done. 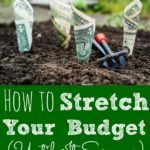 You can even do as I have and put up a sticky note with what you have to save each paycheck for certain bills so you remember. Add up all your yearly or twice yearly payments. Divide that number by 26. 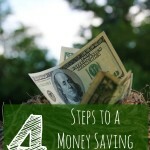 That is the amount you will need to save each paycheck to make those payments. Think of things like car registrations, homeschool curriculum, certain insurances, membership dues (like Amazon Prime), etc. Those items all seem so big when you pay them but split into 26 payments, are much more manageable and helps you be prepared when they are due. Our sinking fund amount is around $35 per paycheck. That amount is less of a sticker shock than the big number of one of those yearly bills. This concept also works if you are paid weekly. Just divide by 52 instead of 26. You should hopefully know how much you spend each week on groceries and gas. 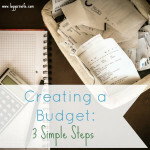 If not, check out my post on creating a budget in three simple steps. After you pay your bills and set aside your sinking fund amount, subtract out groceries and gas. I really suggest doing cash for groceries. I have found it so much easier since going to bi-weekly pay. It makes it easier to not accidentally spend that money on something else the first week then not having grocery money the second week. Even if you don’t use cash for your grocery budget, remember to subtract it out for both weeks, not just one. With both gas and groceries, err on the higher end. If one car typically does $30-35 per week in fuel, set aside $35. Be careful to not spend it on anything else! Some months, not many, will have three paychecks. Take out your expenses like groceries and gas but since you base your bills on twice a month checks, you’ll likely have extra money in that paycheck. Use that extra to pad your savings or pay down debt. Or even a mix of both, like if you are saving for Christmas or need extra in your emergency fund but still trying to pay off debt. It would also be a great time to replace worn out work boots or another necessary but not typical expense. The one thing you don’t want to do with it is blow it on just doing fun things or fun shopping. A little fun is okay, just don’t use it all on fun stuff. Use that third paycheck wisely. 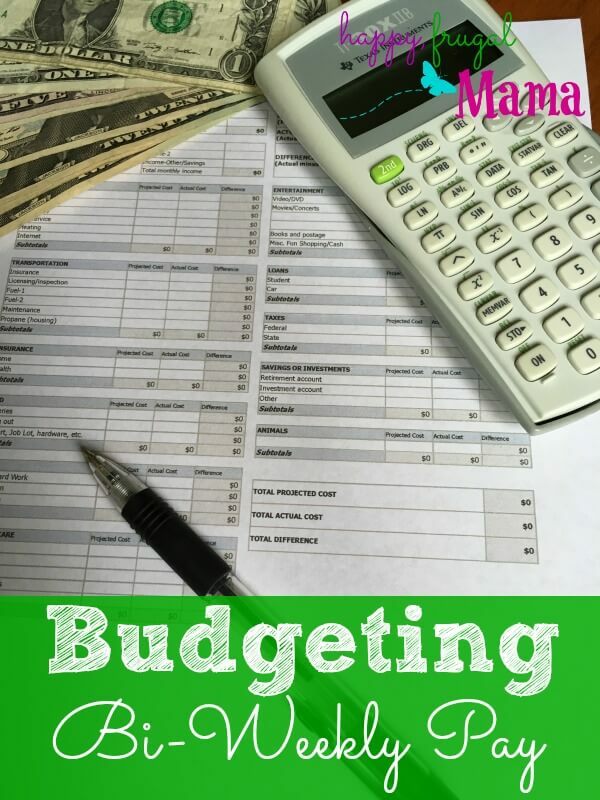 Budgeting bi-weekly pay can feel confusing if you’re used to weekly paychecks. With just a few basic concepts, you’ll find it much easier than you realize. In fact, after you get used to it, bi-weekly can even be great as it saves you time on the off weeks. No more weekly bill paying.